Revisiting: What Do You Sell? 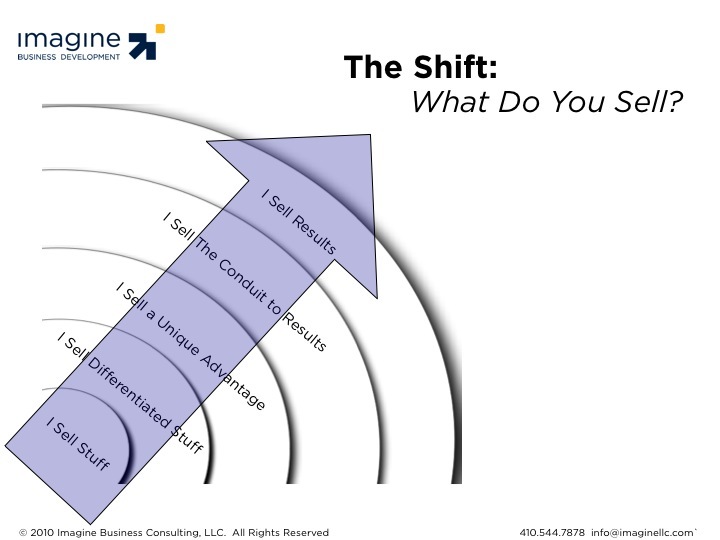 In April, I discussed the need to shift from selling “stuff” to selling results. Making that shift requires a change in mindset far more than merely talking about what you do differently. In your mind and actions, you must change the focus of what you sell. One of the things we do to help companies achieve this is 1:1 sales coaching of their salespeople. If we start our conversations about their salespeople or their coaching/training programs, then we are selling on the left side and will be commoditized. Even if we’re asking questions and learning what they like or don’t like, we are in the “we-do” trap and our sales process will get bogged down. This is true even if the customer/prospect calls up in search of sales training/coaching (or whatever it is that relates to what you sell). As a matter of fact, this is one of the most common – and costly – sales traps out there. The customer sounds like they’re looking for exactly what you provide, using the exact words you use to describe it. Figuring you’ve got a “lay-up”, you explain your stuff and before you know it the customer is lost or pressuring you on price. From the very first moment you engage with a customer, you’ve got to make a critical decision: are you going to focus on the stuff or on the result? If you’re going to focus on the result, which is critical if you want to be selling on the right side, then you must not engage at the tactical level until the result has been clearly defined, as well as (at least) the initial barriers to achieving that result are identified. When I get a call from someone who wants to talk with me about doing sales training, my response is always – “What do you want to do sales training for?” When they respond, “To increase sales,” I follow up by asking them to explain what is preventing them from making the sales they desire. That opens up a line of questioning and conversation that allows me to radically differentiate our programs and create the value necessary to make profitable sales.